Cancer Dream Teams: Road to a Cure? Really? Who can tell me what is missing from this list? How about “nutritionists, fitness experts, you and I? Why do I include “You and I” in the list of epigenetics above? Because “You and I” can figure out a better cure than all of the above specialists. Did you know that the US NIH (National Institute of Health) has published year after year that the leading preventable cause (after tobacco) of the two leading causes of annual death (cardiovascular diseases and cancers) is being overweight and obesity. 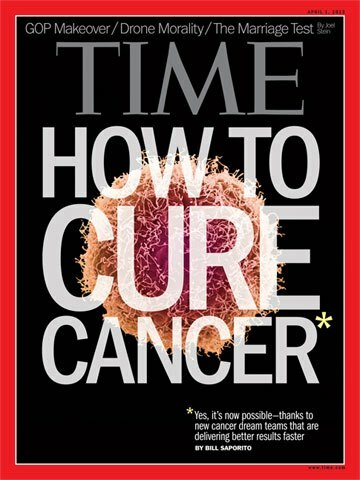 This cover photo leads you to believe that a cure is coming right? This is the illusion created by the western medical industry that over the last 40 years has spent trillions of research dollars paying hundreds of thousands of clinical researchers and profiting billions of dollars to pharmaceutical companies with now thousands of useless and dreaded cancer drugs… not a dent has been made in cancer prevention, not near what a good lifestyle, good diet and many natural modalities have done. Already we know that cancer can be prevented and reversed by a healthy consciousness leading to a healthy mind manifesting in a healthy body. If 10% of the money spent on drug research was spent on educating the children and the public on the relationship food / disease, then 90% of cancers would be prevented… this is known by most intelligent academically trained wellness researchers and scientists. The Cancer research institutes and most research projects are 100% affiliated with profit oriented Pharmaceutical companies, and the AMA and its members are subservient of this industry.